Have you every sent a page or post to the trash on your site and then wanted it back days later? Or, has a plugin suddenly goofed up your database? It’s not easy, if at all possible, to restore such things from most backups. Well, unless you have Server Rewind. It’s exclusively available on A2 Hosting. And it’s free. Yep, free. Let me tell you why I love this feature and how I use it for my sites and those of my clients. Many reputable hosts make backups of your site. But, it’s usually an all-or-nothing restore process. You can get to Server Rewind directly from your cPanel. So you won’t even need to call the Guru Crew to do it for you, although you can, if you like. They’re always eager to help. To find your backup, log in to your A2 cPanel and scroll down to the Files section. Click the icon for Server Rewind. You’ll see a list of dates of the backups. 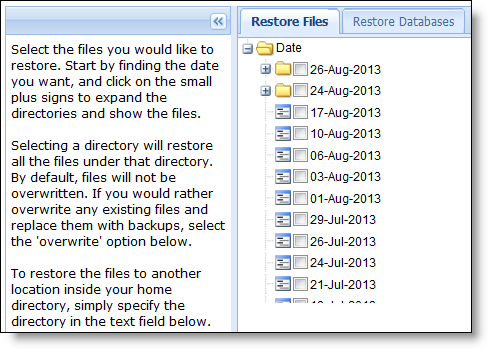 Just click on the + sign beside one of the dates to navigate through the files and find the one you want to restore. You’ll also see two tabs at the top. The one you landed on by default was for files. The other is to restore your database. Server Rewind is just one more tool in your entire backup plan. It does not take the place of your own backups stored offsite. Any backup that is still on your hosting is vulnerable, no matter if it’s done by your host or a plugin. You need to have a backup file stored offsite. My recommendation is BackupBuddy and store on AS3. For more, read my free report on 14 backup and storage solutions. Server Rewind is 100% free on shared hosting and reseller accounts. A2 dedicated servers have a different backup system provided by A2. I LOVE the super speed I’m getting with the solid state drives (SSD). Makes page load for the viewer fast, and has spoiled me rotten with working on the admin side. So much so, that it’s actually painful to have to wait for an admin page to come up when I’m working on a client site. You’ll love all that speed, and perks like Server Rewind too. Download my A2 Hosting Migration Guide. It will take you step-by-step through the process on everything from getting your A2 account (with discount), to pointing your domain to A2, to preparing for your free site migration, and how to get your prorated refund from your old hosting. I would be interested in your review of A2 Hosting. Thank you!